HAVE A TEE-RRIFIC CHRISTMAS & A TOASTY NEW YEAR!!! Just a little reminder that Friday is our last postal date for Uk & Ireland orders on the website. But if you are about Belfast over the next few days you have another chance to catch us at these events, hope you can make it! Save yourself the trip into town this week and celebrate Christmas at Blick this Thursday with carol singers, mulled wine and mince pies, authentic spanish paella, hot coffee and cocoa! Support local industry, buy unusual and unique gifts from local designers and artists, with free on street parking and a great festive atmosphere you won't be dissappointed! Fashion Souk Design Market at Una Rodden’s city centre boutique on Sun 21st December from 12noon - 7pm; DJ Sofakid will provide laid back beats as shoppers relax into a new kind of retail experience. Black Market is a new monthly event at the Black Box, with stalls manned by some of the finest local independent artists, designers, crafters, jewellers and record labels, alongside bountiful stalls from collectors of records, books and vintage clothing. Enjoy a laid-back Sunday's hoak through the many vibrant displays for that special gift, or treating yourself to some weird and wonderful surprises from the bric-a-brac stalls. Black Market provides an unique opportunity to view the wares of these talented creatives and avid collectors all under one roof, in a relaxed and friendly atmosphere. There'll be some sweet and savoury home-baked delights available, with music from special guest DJs throughout the day. Black Market stalls are provided free of charge, with a voluntary donation to our chosen local charity each month. This month's charity is Women's Aid Belfast. Ooh my goodness, it's almost Christmas! Wow! Christmas is almost here again, can you believe it? This is a crazy time of year at teeandtoast HQ - so it would be really nice if you could help us out & avoid total mayhem here. Please order sooner rather than later & that way we will get your presents to you on time. As a little thank-you we are giving 10% off all orders placed before midnight Monday 8th December. Just enter the code: hohoho and apply the changes at checkout. LOOK WHAT'S FRESH OUT OF THE TOASTER!!! 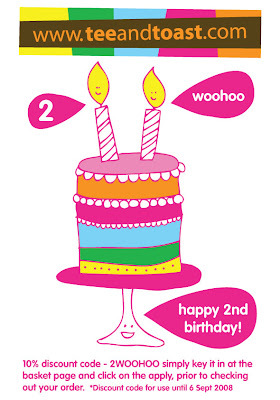 Wonderful new designs available for little and big kids too! DINOSAUR TEE... Rwwwwwar... i'm the cutest dino ever. UNICORN I'M MAGIC TEE... Wow the most magical of t-shirts. This little unicorn thinks it's magic and we do too! HOOT HOOT OWL TEE... a cute little owl t-shirt designed and hand doodles with love by teeandtoast. 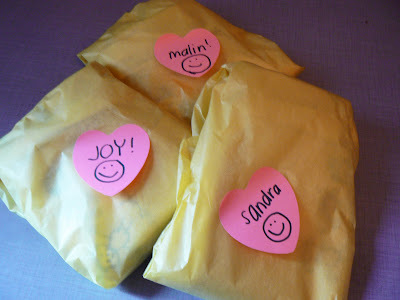 What do you do if you have missed the last post or if you can't decide what to get for that special prezzie? Then look no further, teeandtoast gift vouchers are now available. Just choose an amount you want to give and let them choose what they want! every doggy needs a stripy jumper for xmas! Lots of doggy owners keep asking when will teeandtoast do doggy t-shirts and hoodies. We'll we are still researching into suppliers and trying to find the perfect tee or hoodie for our doggy fans out there, but during our search we came across these wonderful stripy jumpers - sooooooo teeandtoasty, we couldn't resist. Make sure you get your pup one while you still can - as stock is limited. WOOF! Stay warm this winter, wear hoodies and eat soup! Brrrrr.... is it just me or is it beary cold these days? Are you ready - well put a lovely apron on incase it gets messy and lets get cooking... Chop onions and garlic cloves. Peel & chop sweet potatoes. Scrub & slice parsnips. Sauté onions and garlic in olive oil, then add the vegetables, nutmeg, salt and pepper. Cook for a 5 minutes. Mix the veggie stockcube with about 1L of water and add to the pan. Cover & simmer for about 20 minutes. Once the veggies are tender, then blend the soup or mash till smooth. Remember to check the seasoning! 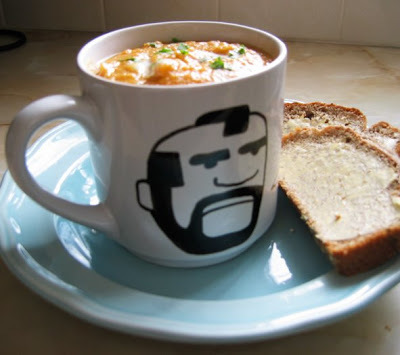 Our big Mr T pint mugs are great for soup! 16 creative shop designs for tee-shirt lovers. yeah!!! paul anthony, a nice guy over at blog.webdistortion.com put us on his list of favourite t-shirt websites! it's nice to feel loved! check out the rest of the blog for some other interwebby top tips! a week of endulgence, a week of being guilt free - could this be the best week ever? yes it's chocolate week. Running from Monday 13th October until Sunday 19th October. In Belfast two of our lovely friends, Oscar from Suki Tea & Deirdre from Co Couture Chocolate are running a fabulous event to mark the week. 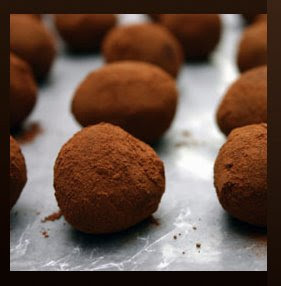 Both are gold star winners of the 2008 Great Taste Awards and will be celebrating together in an evening of tea & chocolate tasting, including a sampling of limited edition Co Couture / Suki Tea truffles. lucky us at teeandtoast are taking a little break for a few days. mixing a bit of work with pleasure, we are going on a little road trip around Ireland. MON 29 SEPT - SAT 5 OCT.
regular shipping of orders will resume on Monday 6 October! malin ericsson and her holland windmill pic! sandra clarkson and her happy camper pic! joy greenhalgh and her perfect cuppa tea at glasto pic! why not check out the collection we have started on Flickr at teeandtoasts happy gallery! Have a nosey at this new art blog called - Clogged Nozzle. It's great to get some inspiration from the latest arts scene, exhibitions & graffiti from around the world! If you'd like to get involved or have something you would like them to feature please email Rob at rob@hilken.co.uk with clogged nozzle in the subject line. prior to checking out your order. 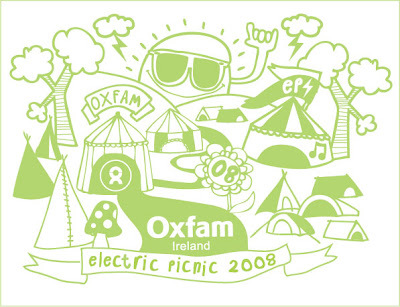 Oxfam rocks Electric Picnic 08! 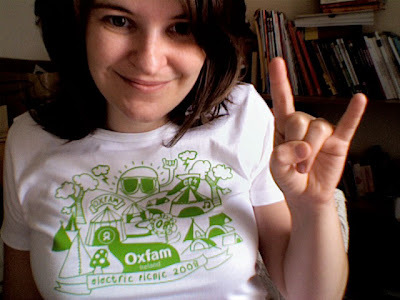 Lucky us at teeandtoast got the chance to design this tee-rrific t-shirt for Oxfam Ireland to sell at this years wonderful boutique festival Electric Picnic 08. After looking at a few of the designs I had doodled for them they choose this illustration of a festival campsite - tipee's and all! It's printed bright oxfam green on a white fairtrade cotton tee, and a limited edition of 50 are only on sale at the Oxfam Ireland festival shop for a super dooper €15!!! wow! So make sure it's your 1st stop at the festival as they aren't going to be around forever! The Oxfam Ireland Shop will also be kitting revellers out in the required festival chic, funky & fun vintage and costume jewellery! Their campaigns team will also be on hand with lots of activities (fancy customising those wellies?) to keep everyone busy. And as if there wasn’t enough aural goodness floating around Stradbally, they’ll also have an open mic set in-tent with some very special guest performers. Electric Picnic kicks off on the 29th of August and runs until the 31st. I left work a little early today :) The sun was shining all day and I knew it wouldn't last forever! So i got all the web orders out, dashed to the post office and headed for a big walk on the local beach - Portstewart Strand! I started off by having a wee paddle - which suddenly became a big wade, but i wasn't brave enough to go for the full dip! All good things come to an end - I'm now back in the studio about to toast away the evening... fingers crossed i can do the same tomorrow! p.s i didn't build the sandcastle... i just liked it! 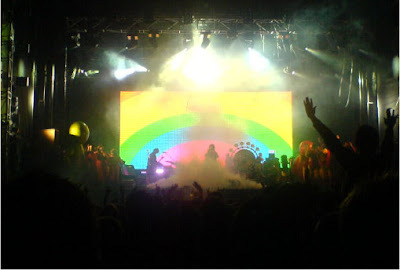 Last night I went to see wonderful The Flaming Lips who where playing in Belfast as part of the Belsonic Festival. It's my second time seeing the band - who never fail to deliver a magic stage show. Lead singer Wayne Coyne made his famous entrance like a bubble boy - in his big inflatable ball. The show continues with all the things I love... rainbows, colourful confetti, giant party poppers, dancing people on stage in fancy dress & songs that sing about toast! whilst waiting for the flaming lips to come on stage last night i was handed this note book. 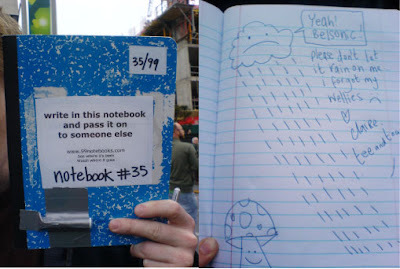 it is 35/99 notebooks that are traveling around the world as some kind of a little experiment. 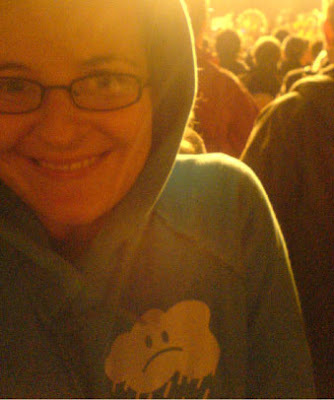 my contribution to the book was inspired by the weather - on our way up to belfast we drove through the darkests clouds, deepest puddles and an ocean of rain fell from the sky - so I was dreading that the gig might be a soggy affair... but my lucky raincloud hoody came to the rescue and it was yeah,yeah,yeah A-ok! 08-08-08 today is world hula hoop day... hurray! I've been looking forward to this day for a wee while, and now it's finally here. 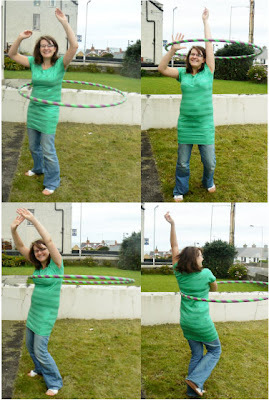 the sun is shining :) so everybody go get a hula hoop and start hooping! time for a garden tea party! YAY! IT'S A SUNNY DAY TODAY HERE AT TEEANDTOAST! Is there a better way to spend a sunny day than chill-axing in your garden surrounded by teeandtoasty cuteness? lets hope that grumpy raincloud stays away!